Earlier this month I spent a week in the US visiting some of the overseas operations of Australian listed businesses held in the portfolios we manage – both long and short. A thorough understanding of a business, and the challenges and opportunities it faces, is vital to checking the assumptions underlying our price target for it and determining whether we continue to want exposure to it. I will discuss one of those stocks below (Micro-X ASX: MX1, which has had a positive announcement this week) but first some general observations on the purpose of the trip and how it was organised. Getting away from senior company management in Australia, to talk to local management, their customers and their suppliers, allows different perspectives on businesses we already know. There are always new things to find out, hopefully more good news than bad, but either way, it’s better to find out and react as early as possible. I was pleased to find that the good news continues to vastly outweigh the bad, giving me confidence that the portfolios are well positioned, despite recent challenging markets for smaller cap growth stocks. Over the years, I have been on a number of overseas fund manager trips and typically these are organised by an institutional broker with Swiss like efficiency. The beauty of doing my own trip is that I can run my own race, I can target who I want to see, when I want to see them (based on their availability). On this trip, in particular, I was focusing on senior managers/executives who are close to the coalface. 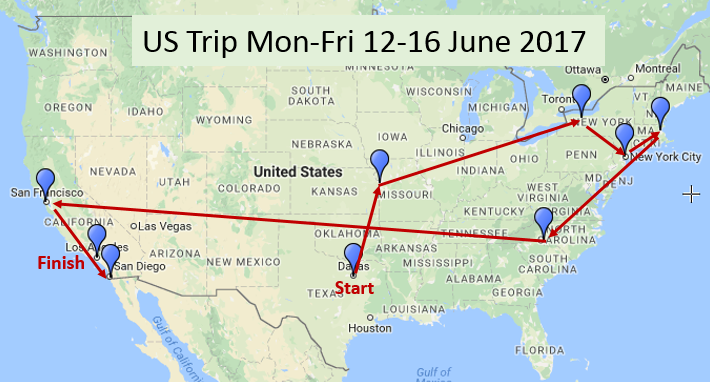 As you can imagine a lot of planning goes into a trip like this, and when plotting an efficient route, it’s a case of multiple trains, planes and automobiles and very accommodating company executives. In five days, I went to eight cities and conducted 12 meetings/site visits. It was a busy trip. Most days I had two flights. I found that delays in US air traffic tend to build up over the day, so that my night time flights were usually delayed. One of the benefits of a 24/7 flight economy is that here were no airport curfews, in fact on two occasions flights originally scheduled for 9pm actually left after midnight. Micro-X has developed a mobile x-ray machine for hospital use that is about 15% of the weight of existing machines without loss of image quality. Based on carbon nano tubes, their laser based x-ray is a quarter of the size and weight of traditional tube heads. The bigger saving in weight and size results from not needing to generate high temperatures to function. 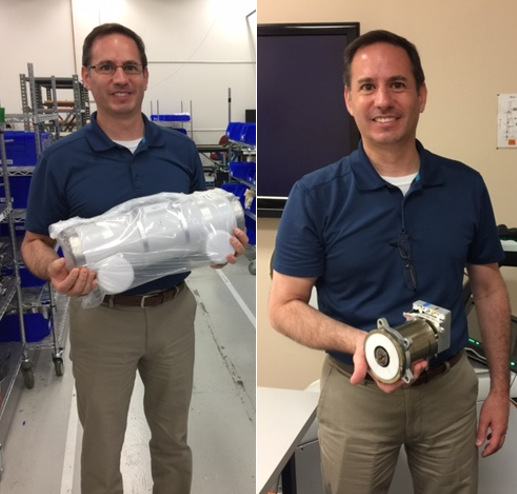 The contrast in tube heads is shown in the pictures that I took while seeing their distributor, Carestream in Rochester, New York. Carestream is an ex-Kodak company, now owned by Onex, listed in Canada (TSX: OCX). Carestream are the largest manufacturer/distributor in the world of Digital Imaging Mobile X-Ray machines. This is a growing market as digital replaces analogue over time. My visit to Carestream was made to get an understanding of Carestream’s approach to marketing Micro-X’s “Nano”: their views on the industry dynamics, size of the market opportunity, the level of resourcing they would commit and how well prepared they were, given the imminent launch of the product. I met them without any-one from Micro-X being present and spent about 2 hours with them, including touring their factory. Pictured above is Mike Ficarra, the Senior Project Manager. I also met with the Clinical Development Manager (a radiologist), the Lead Service Engineer and the Chief Operating Officer of Carestream. Over the course of the meetings, it became obvious that successfully selling the Nano is very important to the Carestream business. Competition for traditional digital x-ray devices is intense, and the Nano is a differentiated product that has no competition. Carestream sees it as an opportunity to increase their sales and to maintain their market leadership. It is branded Carestream. They confirmed previous reports that it has met with extremely positive customer feedback at radiology trade shows. See the pictures below of me standing next to their traditional machine (the DRX-Revolution) on the left and the DRX-Nano on the right. The Nano is much lighter, but its big advantages are in cost, manoeuvrability and ease of use. The portfolios we manage originally invested in MX1 pre-IPO at the equivalent of 21c in November 2014. It listed on the ASX at 50c in December 2015. Since then the shareprice has averaged in the 40’s while the development of the DRX-Nano was finalised, and despite an additional capital raising at 40c per share in April 2017. About a week after I came back from the recent trip it announced that as expected Carestream had just received FDA approval to sell the DRX-Nano and it closed on Monday 26 June at 47c. We expect that its sales will build substantially over time, and should be well above the estimates of the two broker’s analysts who are covering it. There are also other uses for the Micro-X technology and we expect to see more products rolled out. Our price target is a multiple of the current share price.